Federal's Gold Medal match ammo is well regarded as one of the finest commercially available match ammunition options out there. 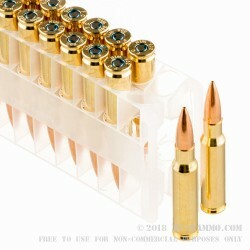 This bulk case of GM308M features 500 rounds of 308 Win ammo consisting of 25 boxes containing 20 rounds each. 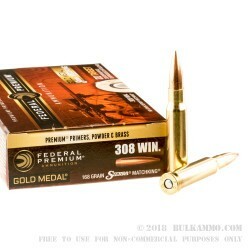 This ammo features high-end reloadable brass casings topped with Sierra's world-renowned 168 grain Match King projectiles. Sierra's Match King bullets have extremely tight tolerances and utilize thinner jackets than non-match ammo helping the bullet to conform to your barrel grabbing the rifling all the way down the barrel as it speeds out the muzzle. 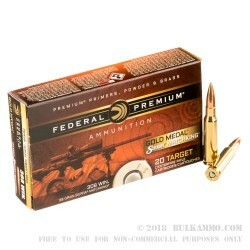 This ammo uses only the finest components including Federal's Gold Medal primers and high quality powders to achieve incredibly tight groupings shot after shot. 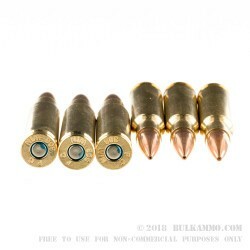 Even if you're not a veteran marksman you'll quickly notice the difference in your own accuracy between this ammo and more standard "ball" ammo. Federal ammunition is manufactured in Anoka, MN and has a proud heritage of providing innovative products to meet shooter's needs in the toughest situations.